Way back at the start of the year, I sowed what I thought were butternut squash seeds. The plants grew healthy and strong, and I had way too many for my garden so happily dished out the excess plants for my friends to grow. As the season went on, the plants snaked across the veggie plot, and everyone commented on how well their plants were doing. However, there appeared to be just one teeny problem. 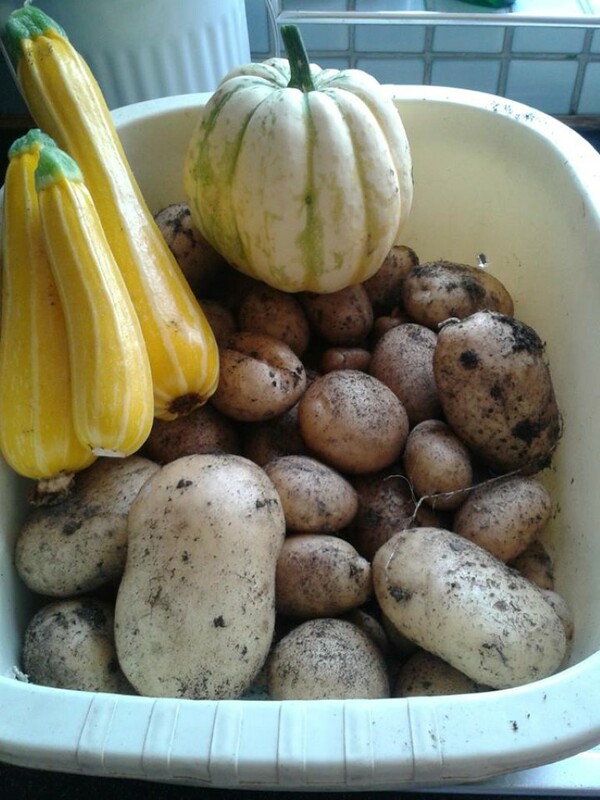 As the flowers subsided and the fruits developed, they looked to be anything BUT butternut squashes. One thing was certain: I’ve never seen them in any of our local supermarkets. 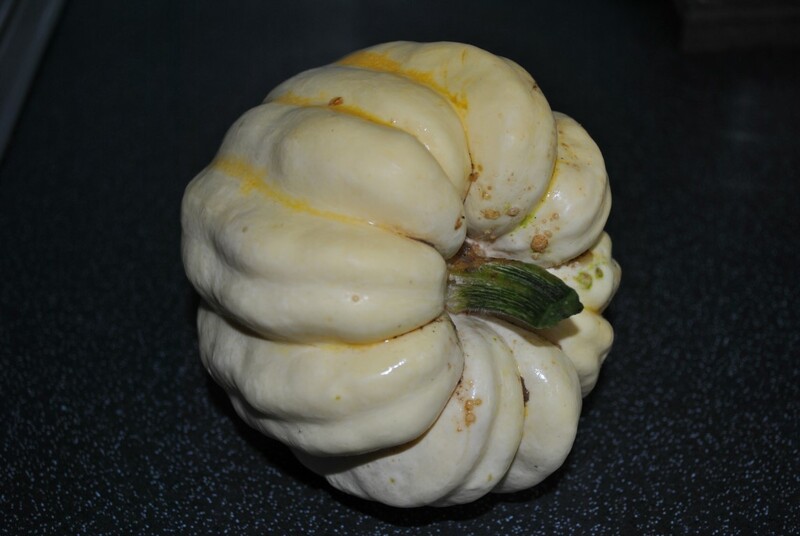 After an extensive rustle around on the t’interweb, I discovered that what we’d all grown were, in fact something called sweet dumpling squash. Now, I’ve never even heard of these, let alone know what to do with them, but a further dig about revealed that they can be used in exactly the same way as butternut squash. They’re just slightly sweeter and a different shape. Phew! That cleared up I set about transforming them into a hearty soup. Just a quickie (oooerr Missus!) this morning. Yesterday, I hit upon a beauty – easy and delicious, and it may even make its way onto the Christmas menu. Mashed squash. Add a splash of brandy mix well, reheat and serve. This would work well with sweet dumpling or butternut squash. 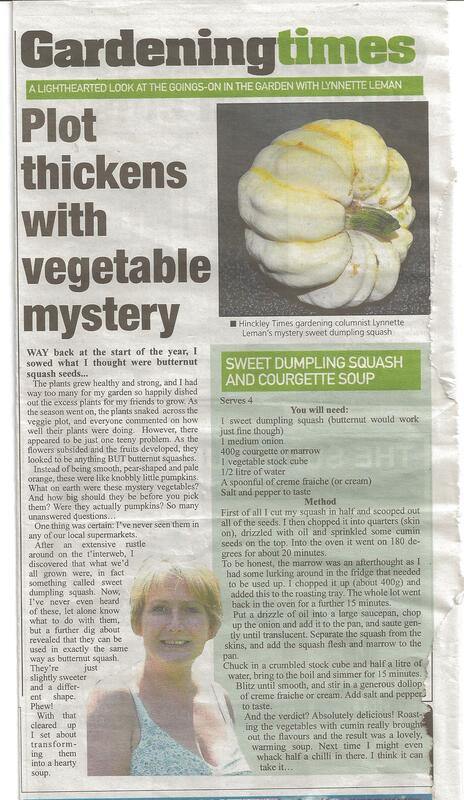 Now I’ve found out that my mystery squash was a sweet dumpling, I thought I’d transform it into a lovely autumn soup. First of all I cut my squash in half and took out all the seeds. 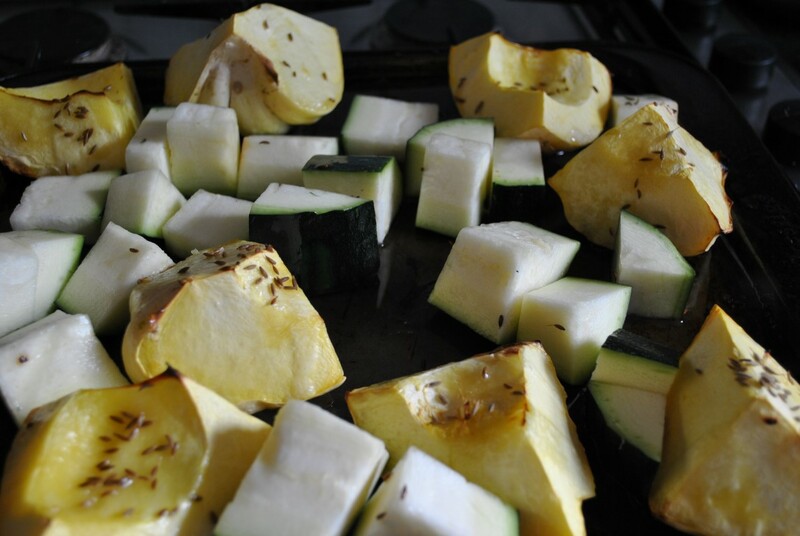 I then chopped it up roughly, drizzled with oil and sprinkled some cumin seeds on the top. Into the oven it went on 180 degrees for about 20 minutes. To be honest, the marrow was an afterthought as I had some lurking around in the fridge that needed to be used up. I chopped it up (about 400g) and added this to the roasting tray. The whole lot went back in the oven for a further 15 minutes. I use a soup maker, but a large pan with do just fine. Chop up the onion and add it to the pan, and saute gently until translucent. 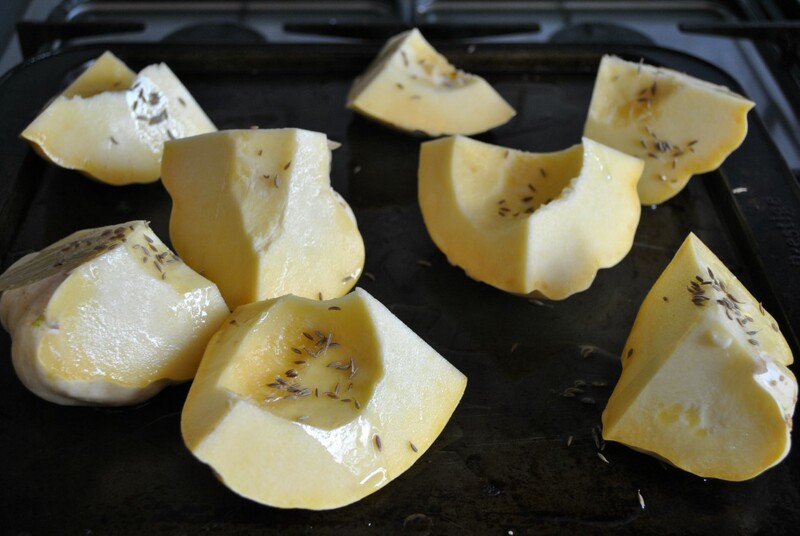 Separate the squash from the skins, and add the squash flesh and marrow to the pan. Chuck in a crumbled stock cube and half a litre of water, bring to the boil and simmer for 15 minutes. Blitz until smooth, and stir in a generous dollop of creme fraiche or cream. Add salt and pepper to taste.